We're back from vacation! It's always alway a little tough to get back into the swing of things, but it does feel great to be home. It was a nice treat to return home to ripe blueberries, raspberries and strawberries. Our garden is really doing great and providing us with lots of fun (not to mention food)! Carson just loves going out each morning to check on his plants. We're really working on the concept of "ripe" fruit. A few too many green blueberries are being eaten in the process, but patience is a tough concept, and hopefully we'll get there eventually. Blueberries remind me of my childhood. My parents have a whole patch of huge bushes that produce more berries than our family can eat. And, blueberry season certainly wouldn't be complete without a batch (or a few batches) of my mom's blueberry muffins. This recipe is just delicious. Mix the sugar, butter. Add egg. Stir in the flour, soda, salt, milk and vanilla. 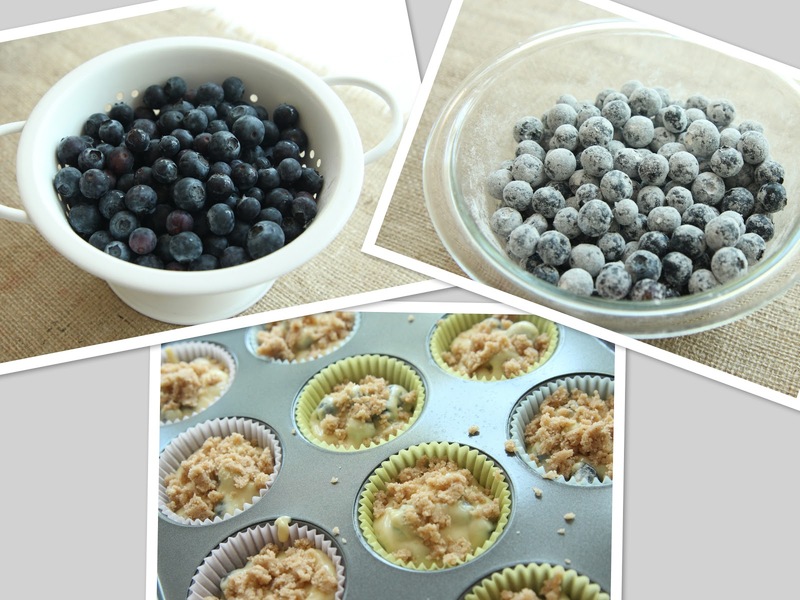 Use the extra Tablespoon of flour to coat the blueberries (this keeps them from sinking to the bottom of the muffins). Fold the coated blueberries gently into the batter. Spoon batter into muffin tins, filling about 3/4 full. Top with crumble topping. Bake at 375 degrees for approximately 18 minutes. I love blueberry muffins and this recipe sounds super yummy. Of course it would be nice to be able to walk outside and pick the blueberries but alas, I buy mine at Trader Joe's! Hope your vacation was wonderful.